Two recipes for Kourabiedes: the classic ones, which are Greek shortbread cookies and Phoinikota, which are the Cypriot ones, filled with dates, nuts and spices. 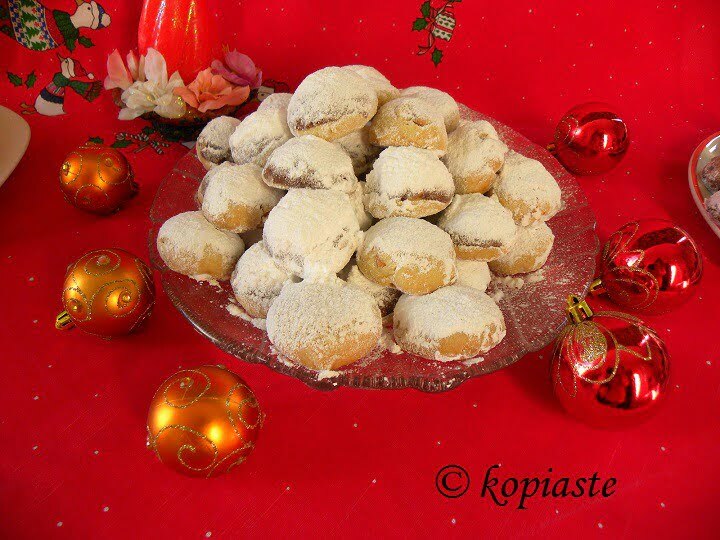 Christmas is nearly here and in Greece melomakarona and kourabiedes are the most popular among the sweets we make. It’s impossible for us to imagine Christmas without them. In a few days the platters will be full of them and the bakeries and confectioneries will have “white mountains” of kourabiedes, for those who do not have the time to prepare their own. The recipe is usually made with ewes’ butter but in Cyprus we usually add spry shortening, well known in Cyprus but unknown in Greece. I cannot find spry in Greece, so I have adapted the recipe making it with a mixture of ewe’s milk butter and vegetable oil shortening. In October when I visited Cyprus during my last minute shopping I remembered to buy some spry but unfortunately I was unlucky because the supermarket was out of stock. I tried to find information about spry in the internet and the only thing I found is this. This year I made two kinds of kourabiedes. The first one is the traditional one and the other is with dates, almonds and spices. If you want to try both, just keep half the dough without the almonds and follow the steps given at the end. The dose of the filling is for all the amount of kourabiedes. Beat the butter with sugar at high speed for about ten minutes. Reduce speed and add egg yolks one at a time, until mixture is light and fluffy. Dissolve soda with brandy and orange juice and add to the mixture. Beat for 2 – 3 minutes. Add vanilla. Mix flour with baking powder. Change the mixer paddle to the one for dough or start kneading by hand and add flour gradually.When the dough is ready, it should be as if it needs more flour but should not be sticky on your hands. Add the almonds and mix. Take a small amount of dough and shape them round, oval or crescent shaped. Place in a buttered tin or lined with parchment paper and bake in a preheated oven to 180 degrees C for about 25 – 30 minutes. Allow them to cool on a wire rack. As soon as they are ready, spray or sprinkle some rose water on them and then sieve the confectioners’ sugar on both sides and place in parchment paper and let them cool. Transfer them into a platter, sprinkling some extra sugar on top. Phoinikota, from the Cypriot word phoiniki (φοινίκια) which means dates, are kourabiedes filled with dates, nuts and spices. They are made the same way as kourabiedes, without the nuts in the dough and the other difference is the addition of the filling. Place butter dates, almonds, sugar, cinnamon and cloves in a small pan and put over moderate heat until butter melts. Lower heat and continue stirring until the mixture softens and mixes. Add rose water and stir two or three times. Place the mixture in a bowl and let it cool. Meantime prepare the dough as given for the traditional kourabiedes. Take a small amount of dough and flatten it with your hands. Take small amounts of filling and shape them into small balls. Place a small amount of filling and fold to cover filling. Place the folded part on the baking tray. To make the crescents, after flattening the dough, form the filling into a cord and enclose with the dough. Shape them into a crescent, making the edges pointy and bringing them forward. Proceed with the baking and coating procedure given above. Mix flour with baking powder. Change the mixer paddle to the one for dough or start kneading by hand and add flour gradually. When the dough is ready, it should be as if it needs more flour but should not be sticky on your hands. Add the almonds and mix. Take a small amount of dough and shape them round, oval or crescent shaped. Place in a buttered tin or lined with parchment paper and bake in a preheated oven to 180 degrees C for about 30 minutes. Allow them to cool on a wire rack. As soon as they are ready, spray or sprinkle some rose water on them and then sieve the confectioners' sugar on both sides and place in parchment paper and let them cool. This year, as I did not have some of the ingredients of the above recipe, I made them with dates, filled with two roasted almonds, with skin on, in each. They came out so delicious! The recipe I followed was that of Melt in your Mouth Kourabiedes. The Kourabiedes look real good and I’ve never had the stuffed ones…they sound tasty. I really don’t understand how some Greeks will buy a box of Kourabiedes from a bakery for 20 euros when they are so easy to make. I don’t either. Most women find as an excuse that they work and they have no time, but I think that if you like doing something you find time for it. I have been working since I graduated high school and always found time. Nice looking cookies, Ivy! As for baking, at least in the village where our house is, the really is not much of a culture of baking. I think it is because until recently, people used the village oven or an outside wood burning oven, neither of which are particularly conducive to baking cookies. I bake a lot when we’re in the village, and this is unusual enough that I get lots of comments about it. As for Spry, at least in the United States, Spry and Crisco were pretty much the same thing: solid white vegetable shortening. It seems like I’ve seen cans of Crisco in Athens, but now that I’m thinking about it, I can’t say for sure. I agree white shortening makes good Christmas cookies — I make some every year, they are called Angel Cookies, and they are very very good. I particularly like them with cashews. On the other hand, Kourambiedes I’ve only made with fresh butter (from cows). They’re good too!! (And Peter, you’re right, they’re very easy and much better than what you can buy at the bakery). 1/2 TABLEspoon of cinnamon & 1/4 TABLEspoon cloves…is it supposed to be TABLESPOON or TEASPOON? Old traditional recipes are a bid odd on their ingredients. However, 1/2 tablespoon is about 1 teaspoon and 1/4 tbsp would be 1/2 tsp. However the amount of spices do not need an exact measurement. If you add a little bit more or less it will not affect the recipe.